Imambaras are the religious places meant for azadari (mourning) during the time of Moharrum (first month according to the Islamic calendar). Asafi Imambara is also known as Great or Bara Imambara, built in the year 1784 under the patronage of Nawab Asifuddaula. This one is the most sought after and must see monument in Lucknow. An amalgamation of different architectural styles. It is said that the architect of this majestic building was an illiterate fellow. It has a huge central hall (vaulted hall) which is supposed to be the largest and biggest vaulted hall of it’s kind in Asia. It has no pillars, no metallic support. This Imambara is known for it’s incredible maze called “Bhul Bhulaiya”. It has 489 identical doorways, so once you reach at the top of the buliding, it’s difficult to find your way out. One can view the breathtaking panorama of the city from the top of the building. This Imambara comprises of several other buildings in the premises such as – Asafi Mosque and Baoli (step well) which are worth seeing. Also known as Chota (Small) Imambara. Built in the year 1837-42 by the third Kind of Awadh called Mohd. Ali Shah. This beautiful building is much ornate, also houses the tomb of Zenabasia (daughter of Mohd. Ali Shah) in the premises. This tomb is a copy of Taj Mahal in Agra though built with bricks. One can see the excellent calligraphy work on the outer walls of Imambara (verses of holy Quran written in Arabic). Inside the hall is a galaxy of antique chandeliers and candle stands right from the time of Nawabs. Many of them were brought from Belgium and other European countries. At the centre of the hall there are two tombs – one is of Nawab himself and the other one is of his beloved mother. La Martiniere College was deeply affected by the events of 1857. The College was evacuated to the Residency on 13 June, 1857, on the orders of Sir Henry Lawrence, although the Principal, George Schilling, had fortified the school buildings and stocked provisions with the intention of defending La Martiniere. During the stirring events of 1857 the Principal, Masters and boys of La Martiniere played a role, which is perhaps unique in the history of the world. They defended an extremely exposed part of the southern perimeter of the Residency, withstood infantry and artillery attacks and were subjected to mining operations. In the face of great hardship they ably and successfully defended The Martiniere Post for almost five months. Meanwhile studies continued. In 1938 as recognition of the role played by them, the College was awarded colours bearing the legend Defence of Lucknow, 1857. This is a distinction no other school in the world enjoys. La Martinière Boys' College occupies the central portion of the Constantia building and is set in a campus of around 200 acres (0.8 km2), part of which is now used by Lucknow Golf Club. Constantia stands on a landscaped terrace overlooking what was once a lake, from the centre of which rises a solid fluted column with a Moorish cupola known as 'the Laat'. The building is constructed in an unusual mix of styles. The rooms are decorated in bas-reliefs, arabesques and other Italian styled ornamentation. The eighteenth-century English potterJosiah Wedgwood was said to be responsible for the plaster of Paris plaques decorating the library and the chapel. However, the plaques which depict classical and mythological subjects are thought to be of local construction. Orders for tons of imported plaster of Paris were discovered in Martin's letters, it is believed that they are in fact based on just one or two original models. What was imported was the large mirrors, French carpets, inlaid marble tables and paintings including some byJohann Zoffany who was a friend of Claude Martin. The building has been described as, "part Enlightenment mansion, part Nawabi fantasy, and part Gothic colonial barracks. Its facade mixes Georgian colonnades with the loopholes and turrets of a medieval castle; above, Palladian arcades rise to Mughal copulas." This beautiful gate is the signature of Lucknow. It's no surprise that the Darwaza has become the de facto symbol of Lucknow in recent times, whether it's tourism promotion or simply building a brand for the city. 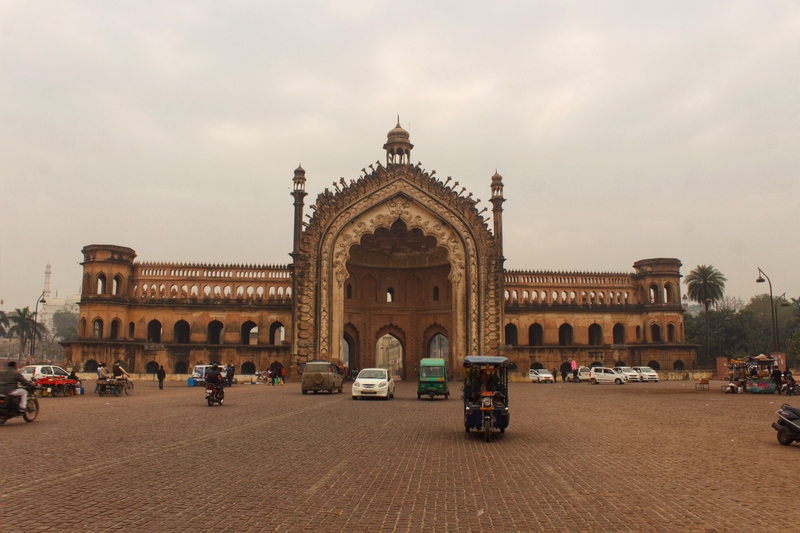 The Rumi gate and sometimes known as the Turkish Gate, in Lucknow, is an imposing gateway which was built under the patronage ofNawab Asaf-Ud-Daula in 1784. 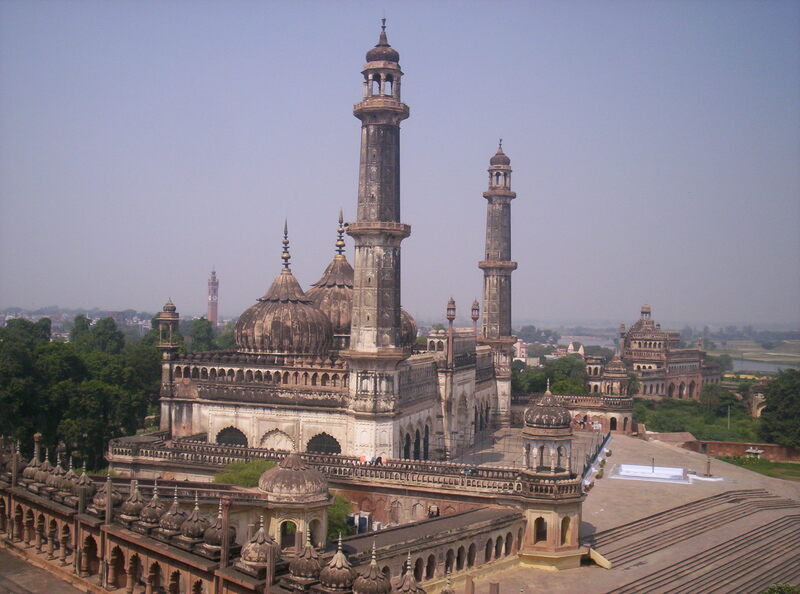 It is an example of Awadhi architecture and a combination of Hindu- Muslim Unity in Lucknow. The height of this gate is 60 feet. The material used for the drawaza is bricks and its then coated with lime, while the Mughals often used red sand stone. This is why the detailing on the Darwaza is more intricate, which would be impossible to achieve in stone. Rumi means Roman (i.e., related to the Roman empire). It is believed that the gate is called Rumi gate simply because it was modeled after the gateways of Istanbul, which under the name Constantinople was the capital of the Eastern Roman (Byzantine) Empire. This tower is in Hussainabad area of Lucknow that’s why popularly known as Hussaianabad Clock Tower. It was constructed in 1881 by Nawab Nasir-ud-din Haider to mark the arrival of Sir George Couper, 1st Lieutenant Governor of United Province of Avadh. It was built at a cost of Rs. 1.75 lakhs. It is a perfect example to the artistic and structural skills of the Englishmen. Husainabad clock tower is the tallest among all the clock towers in India. it was built as a replica to the BIGBEN clock tower of London. Roskell Payne designed this structure of 67 meter high and it reflects Victorian and Gothic style structural designs. Gunmetal is used for building the clock parts. It’s gigantic pendulum has a length of 14 feet and the dial of the clock is designed in the shape of a 12-petalled flower and bells around it. It was constructed during the rule of Nawab Saadat Ali Khan who was the fifth Nawab of the province of Awadh (as per the British Authors it was spelt as Oudh). Construction took place between 1775 and 1800 AD. Between 1 July 1857 and 17 November 1857 the Residency was subject to the Siege of Lucknow, part of the Indian Rebellion of 1857. The Residency now exists as ruins. The Residency is exactly in the same condition as it was at the end of the siege. The ruined building is surrounded by lawns and flowerbeds and is a tourist attraction nowadays. The cemetery at the nearby ruined church has the graves of 2000 men, women and children, including that of Sir Henry Montgomery Lawrence who died during the siege. The ruined building is surrounded by lawns and flowerbeds and is a tourist attraction nowadays. The cemetery at the nearby ruined church has the graves of 2000 men, women and children, including that of Sir Henry Montgomery Lawrence who died during the siege. There were several other buildings which were a part of the complex. Among the other buildings there were Banquet Hall (which served as a hospital during siege), Treasury House, Post Office, Gubbins House, Sikh Square, Sheep House, Brigade Mess etc. However, the main attarctions in the Residency complex are Bailey Gaurad Gate, Tresaury House, Banqueting Hall, Dr. Fayrer’s House. Imambara & Mosque, Musuem and the Residency main building. The first attarction comes as soon as one enters the premises is Bailey Guard Gate. This gate was special as it was made by Nawab Sadat Ali Khan to welcome and show respect towards John Bailey, the residenct of Lucknow at the beginning of 19th century. After this comes the Treasury House on the right side. It’s central part was used as na ordinance factory. Dr. Fayrer’s House comes on the left. He was the resident surgeon in the Residency. Henry Lawrence (resident at the time of war) died in his house on 4th July 1857. Then there is a huge Banqueting hall which was a double storied building with impressive architecture. Right at the centre of Residency complex is the 1857 War Memorial Museum, which has distinctive things of yester years. It houses the model of the whole Residency Complex which was prepared by Thomas Moore in the year 1885. So one can have a fair idea how big the complex was at that time. Adjacent to Musuem is the main Residency building. The central building was constructed in the pattern of European Villas with central halls, side rooms, spacious balconies, flat roof, high pillars, wooden beams and stucco ornamentation work in the interior and outside. This was brilliant construction which however now turned into absolute ruins. The house was constructed around 1800 by the British resident Major Gore Ouseley, a friend of the ruler of Oudh, Nawab Saadat Ali Khan. It was initially intended as a hunting lodge for the Nawabs of Oudh, although it was later used as a summer resort too. Changes were made to its design by Nawab, King Nasir-ud-Din Haider (1827-1837). The building had patterned walls and unusually no inner courtyard as was traditional in Indian architecture. The building therefore had a smaller footprint and did not extend over a large area but was taller than traditional local architecture. The design bears a startling resemblance to the style of Seaton Delaval Hall in Northumberland, England. Seaton Delaval Hall was built in 1721 and was designed by Sir John Vanbrugh, who also designed Blenheim Palace. Dilkusha Kothi is depicted in a rare early albumen print by the photographer Samuel Bourne, dating from 1864-1865. The British actress Mary Linley Taylor was impressed by Dilkusha Kothi and named her own home in Seoul after it. She explained, "From that moment in India when first I saw Dilkusha, the Palace of Heart's Delight, I dreamed of this moment when I would bestow upon our home the name 'Dilkusha'. It is said that in 1830, Dilkushi Kothi was the location for an early balloon ascent by "an Englishman". This story is less notable given that the Frenchman Claude Martin who had been a neighbour when his palace of Constantia, later La Martiniere Boys College, was started in the 1790s. He too had arranged a balloon ascent in Lucknow and he died before the demonstration here. The ascent in 1830 was watched by King Nasir-ud-Din Haider and large number of his courtiers. In 1857 the house was held by Indian insurgents and was forcibly recaptured by British forces under the instructions of British commander-in-chief, Sir Colin Campbell. It has been reported that British General Sir Henry Havelock died on November 24, 1857, but other sources report a less glamorous death from dysentery, although this was almost inevitably caused by the siege. The map illustrated shows how the grounds were at the centre of the British military activity in September and November 1857.